After season five's detour into Archer: Vice, the gang returned to good old spycraft in season six ... which wrapped up last night with the conclusion of the two-parter "Drastic Voyage." Including the heavy suggestion that season seven, slated for 2016, will take yet another new direction. Spoilers ahead! When last we saw them, the gang (minus Krieger, who was making his own trouble elsewhere) had been miniaturized and injected into the body of A Very Important Scientist, Dr. Kovacs, by the CIA. Guided by a grumbling Slater and the oversexed Dr. Sklodowska, voiced by Carrie Brownstein, their mission is to laser a blood clot in the comatose man's brain. If they succeed, Archer and company will get a million dollars each. If they fail, they'll be blackballed from the espionage world forever. But Archer's got bigger problems, namely the lack of cocktail mixers aboard the mini-submarine, which he's still confusing for a spacecraft, given his talk of Tang (if no Tang, Goofy Grape; if no Goofy Grape, he'll settle for Rootin' Tootin' Raspberry). Most everyone else, meanwhile, is very aware that the clock is ticking; they have only 57 minutes and counting to get to the blood clot. A convoluted path via arteries and ventricles is plotted, and everyone straps in for the high-speed ride. Back at mission control, Malory actually shows a teensy bit of concern (can it be? ), though she still has plenty of bile (pro-tip: never ask her to contribute to your Kickstarter) and energy to fat-shame a baby. Gary Cole's Special Agent Hawley is so ready to write off Malory and her employees that when AJ starts wailing, he mutters, "If I were to make a list of things I'm not in the mood for, that would be second." "What do you want me to do, transform into Captain Marvel and save the day?" "I'd be happy if you could transform into Jackson Bostwick." Archer lets the slap slide (to Pam and Cheryl's amazement) and addresses the mission's most pressing concern: white blood cells, which have mistaken the submarine for hostile invaders and are attacking the ship, blocking its clot-busting laser port in the process. 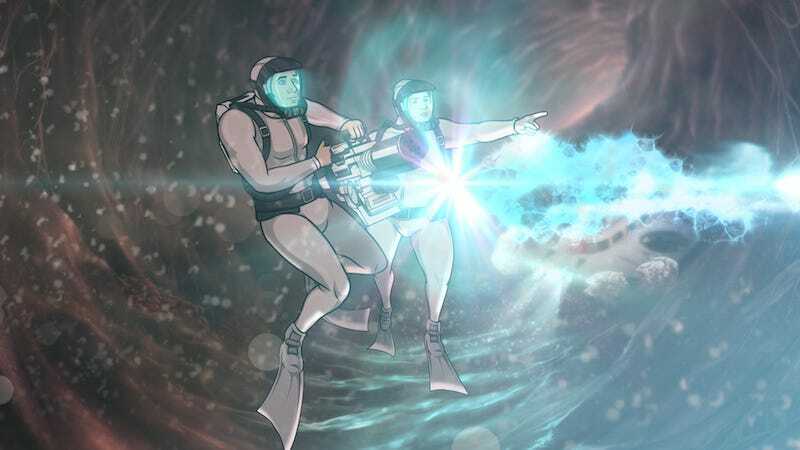 Someone's gotta suit up in scuba gear and laser backpack and take 'em on ... naturally, it'll be Archer, and by process of elimination, Pam will help. With 15 minutes to go, they start blasting away. And though they succeed in zapping the cells and the blood clot, they don't quiiiiiiittttteee make it to the exit point (Kovacs' tear ducts) before the ship and everything on it returns to normal size. "We're the outsiders! The scrappy underdogs! We're Delta House! The Dirty Dozen! The Rebel Alliance! We're the BAD NEWS FRIKKIN' BEARS!" Malory, pearls gleaming, has a very practical concern: "What are we going to do for money?" And with a dramatic sunglasses flourish, Archer's reply ends the episode, and the season: "Well, I actually have some thoughts on that..."
Until next season, Archer! Will we be seeing Vice 2.0 or what? "Go eat several dicks, Slater." "There's enough room in the world for science and miracles." "It's basically the old zerp-and-flerp"/"It's basically the old float-and-gloat"
"I don't believe that I personally can die. Although I do believe in ghosts." "He's had the clap so many times it's more like applause." "So hey, if you've got this..." "I've always got EVERYTHING." "You're a father now. Shut up and be careful!" "No to both." "Is there a steakhouse around, and do they have flowerpot bread?"